Accommodates up to a 6-piece kit and bass drums up to 22" in diameter. 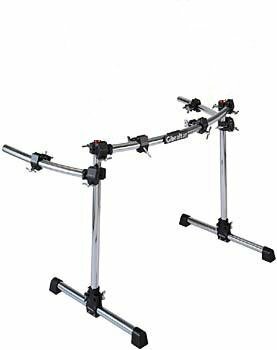 System includes 2 GRSTLA leg assemblies, 2 -vertical bars, 36" curved horizontal front bar, 2 - 24" curved side bars, 4 GRSMC multiclamps, 4 GRSRA right-angle clamps, 4 GPRML memory locks. This rack does not include L-Rods.